The commercial office leasing market is evolving fast, and it is having a fundamental impact on how leases are structured and how property functions are managed. In a bid to retain talent, many employers have renewed their focus on providing better, more collaborative office facilities and on fostering flexible working models. Employers are also gravitating away from “traditional” 10-to-15-year office leases and towards more flexible arrangements in order to create financial agility. As the millennial workforce grows and technology continues to advance, flexible working environments will become ubiquitous. Stakeholders looking to capitalise on this radically changing market must adjust their thinking and re-evaluate their propositions, or risk being left behind. Advances in communications technology, the changing expectations of the millennial workforce and continued economic uncertainty are combining to create a potent cocktail for the commercial leasing market. The office, once simply a practical place of work, is now a powerful tool that businesses are leveraging to improve both their employee value proposition and their financial agility. In the battle to attract talent and boost productivity, work environments are transitioning into more open, youth-orientated spaces, with an increased emphasis on the provision of high-quality recreation areas, better in-office facilities (such as healthy food canteens and quiet spaces) and collaboration-friendly designs. In addition, rapid advancements in technology have allowed companies to foster more flexible working patterns and accommodate the growing employee preference to work at, or closer to, home. With financial agility a high priority, employers are also gravitating away from “traditional” 10-to-15-year office leases and towards more flexible arrangements. Fast-growing businesses with shorter-term requirements and established employers managing cyclicality are seeking more fluid tenancy agreements and a wider range of designs, facilities and locations for their staff. The pace and degree of change is having a significant impact on the workspace rental market, and commercially astute landlords are beginning to respond. Disruptive new entrants catering to these changing needs are accommodating tenants’ aversion to long-term leases, and the rise of turnkey solutions is altering how property is managed. In this Executive Insights, L.E.K. Consulting explores what the future may hold for offices and workspaces, and discusses the key factors stakeholders must address if they are to seize the opportunities ahead. As millennials begin to dominate the workforce, expectations of the modern employee are changing. In the battle to attract and retain upcoming talent, many employers have renewed their focus on providing better in-office facilities. Workspace designs are transitioning to become more contemporary and vibrant, and there is an increased emphasis on high-quality recreation spaces. Plus, with the help of initiatives such as the WELL Building Standard, health and well-being are fast becoming priorities in building and workstation design. In addition, rapid advancements in IT mean that many companies can now foster flexible working models without productivity suffering. As a result, a business’s employees no longer need to be stationed in the same location and companies’ need for dedicated real estate is decreasing. This is particularly true of fast-growing businesses that are likely to have a radically different number of staff (and therefore changing workspace requirements) year on year. Disruptive new entrants. Long-term leases favour landlords, but in an increasingly uncertain business environment, tenants are seeking greater flexibility. A 2016 survey conducted by MindMetre Research claimed that, of the businesses sourced, 37% of firms wanted to avoid fixed leases and 35% wanted the option to react to short-term market changes through flexible offices. New entrants, such as WeWork and UCommune, and more established players such as Regus, are capitalising on this need by creating high-impact, innovative work environments with short-term leases that help fast-growing companies manage shorter-term requirements and enable established firms to manage cyclicality. “Do it for me” outsourcing. Property management is increasingly being viewed as a non-core function, and companies are becoming more comfortable outsourcing to efficient providers that can procure at scale and remove the hassle of managing property moves, office design and ongoing office services. Emerging players (e.g., Instant Offices) offer turnkey solutions and shorter-term leases — an attractive proposition for companies navigating uncertain times. Landlord responses. The changing needs of workers, and therefore employers, are challenging landlords to upgrade the attractiveness of their overall proposition. Many are choosing to do so by investing in more attractive communal and catering facilities within their buildings, and the rapid evolution of the traditional office space has led to many U.K. landlords exploring their own interpretations of more flexible solutions (see Figure 1). British Land, for example, has recently launched “Storey”, a new brand providing flexible workspaces for ambitious businesses within British Land’s existing London assets. The rapid rise in flexible co-working spaces and other turnkey short-term lease solutions is expected to continue as long as the needs of companies and their staff members require them. The growth of flexible office space in Central London, for example, is evident; in 2017, 20% of new office lettings over 5,000 sq. ft. were driven by flexible office space providers1. Traditionally used predominantly by start-ups, the expectation is that the number of businesses seeking flexible working environments will continue to rise, particularly as large corporates such as Google and IBM begin to jump on the trend (see Figure 2). As the millennial workforce grows and technology continues to advance, working patterns will evolve. 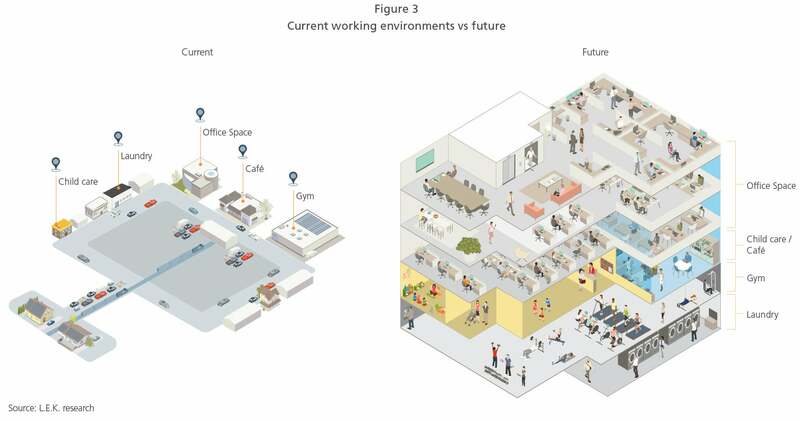 Flexible working environments will become ubiquitous and the office as we know it will change dramatically (see Figure 3). Constant improvements in IT will allow more effective real-time collaboration, and the “plug and play” experience, which allows individuals with a smart membership card to work wherever they are in the region, country or world, will be extended. This move to large-scale remote working will facilitate a massive reduction in dedicated real estate required by companies, and many businesses will prioritise more flexible leases and rental options over longer-term tenancy agreements. Companies adopting flexible working models will be able to offer employees multiple close-to-home options, aligning to growing employee preferences — recent studies have revealed that 36% of employees would choose a more flexible approach to working hours rather than a 3% pay rise2. The likelihood is that offices offering a range of designs and environments will begin to populate local high streets, and for many workers this will result in an “almost zero” commute time. Larger working centres will also evolve to have a range of facilities readily available to employees. Gyms, groceries and doctors’ surgeries will only be a stone’s throw away, allowing companies to better support the health, well-being and lifestyles of their staff. The end result will be a happier and more productive workforce, and the high street may once again regain its status as a viable business hub. Flexible office space opens up plenty of opportunities for a range of stakeholders, but several considerations must be taken into account if players are to achieve success in this market. Established and large corporates must ask themselves how best to take advantage of the changing workplace and improve the impact of their employer value proposition on recruitment and retention. By doing so, they will readily access wider pools of staff to support further growth, attracting employees with a preference for flexible working patterns. Landlords must judge how far they augment their existing proposition for corporate tenants, while preserving the quality of their income streams. It is crucial to align investor needs with the changing landscape and actively participate in the emerging market for more flexible solutions if they are to remain relevant. Agents must find a way to support landlords and tenants as their interests diverge. Disintermediation by new, disruptive business models is a possibility, and as the “virtual office” sector grows, they must find a way to add value to their proposition. Advances in communications technology and the changing needs of employees have collided with corporate desire for greater financial agility to force change on the market for commercial office space. For stakeholders looking to capitalise on this radically changing market, now is the time to adjust their thinking and re-evaluate their propositions, or else risk being left behind.